The Movie Settings dialog box lets you set the compression settings for the movie you will export. NOTE This dialog can only be accessed on Windows and macOS. On Windows, Apple QuickTime must be installed to be able to export QuickTime Movie (.mov) files. Click on the Movie Settings button. Opens the Standard Video Compression Settings dialog box. This is where you can set the video compression settings for the movie you will export—see QuickTime Standard Video Compression Settings Dialog Box. Opens the Choose Video Filter dialog box, where you can select from a range of filters to apply to your video export. Opens the Export Size Settings dialog box. This dialog is available because of the way the Apple QuickTime interface is designed, but its settings are not taken in account by Harmony. The size of the exported video is determined by Harmony. Opens the Sound Settings dialog box. This is where you can you set the sound compression settings for the movie you will export—see QuickTime Sound Settings Dialog Box. If this option is enabled, the video will be optimized to start playing while it is downloading, as videos do in web browsers and web-based streaming applications. Fast Start: The video plays as soon as enough data required to start playback has been downloaded. Fast Start - Compressed Header: Same as Fast Start, except the header is compressed for an even faster start. Requires QuickTime 3.0 or later. 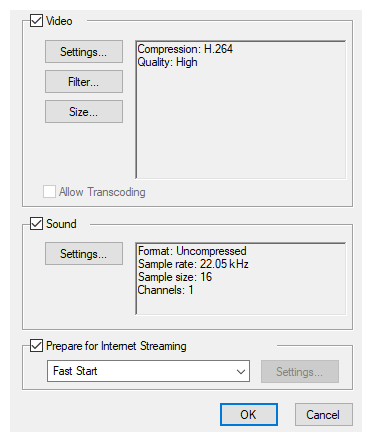 Hinted Streaming: Allows you to optimize the movie file for streaming through QuickTime Server Software. Click on the Settings button to configure how hints are created in your movie file.